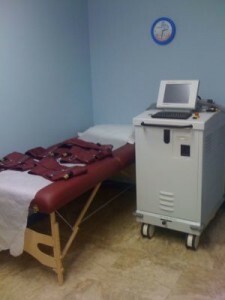 The Cardiomedics model CardiAssist 3000 was one of the first model ECP devices introduced by Cardiomedics Inc. This ECP unit was the first “portable” device of its kind. This device was also one of the first units to have FDA market clearance in the United States. The CardiAssist 3000 was the best selling ECP unit from Cardiomedics. We rate the CardiAssist 3000 (all models from Cardiomedics) the highest in the industry for its smallest footprint. The patient comfort varies as with a Cardiomedics device, one is not limited to any one particular treatment platform or bed. The recommended (optional with purchase) is a message table platform with a mediocre comfort level. This system is operating on a windows platform with a small touch screen monitor. The unit has no known EMR integration capability other than print from thermal printer, then scan for integration. System has early reporting capabilities with an 8 second strip including ECG, Inflation/Deflation timing, and arterial waveform. All peak to peak calculation are manual. Cardiomedics has a mixed review for their cuff design because it is either loved or not so loved. Their “cinch” mechanism generally assist the tech with a tighter squeeze, but report of skin pinching have been reported. The CardiAssist is not known for being quietest unit out there. If you open the device, you will see the device has been sound proofed a bit, but the noise factor is not a big selling point for this device. Above average reliability. Some customers are using the machine for 10 years with no technical issues. Perhaps the biggest weakness today about any Cardiomedics devices is access to technical support in the U.S. Although there are still a hand full of technicians available (through our network) that service the Cardiomedics equipment. Cardiomedics has traditionally been reasonable in price. Service & support can be found from one of our independent service organizations.